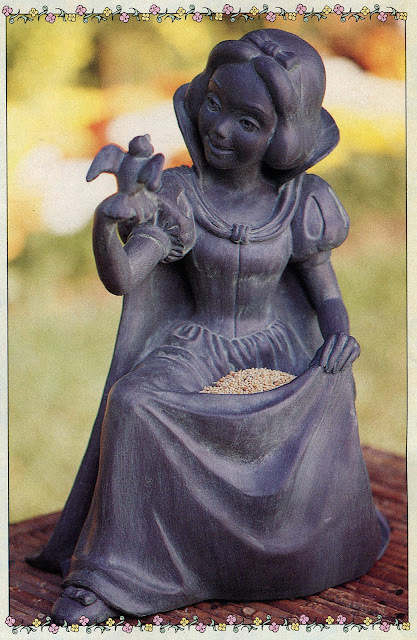 A heavy piece, this Snow White lawn statue stands 16.5" tall and is made of dense resin. 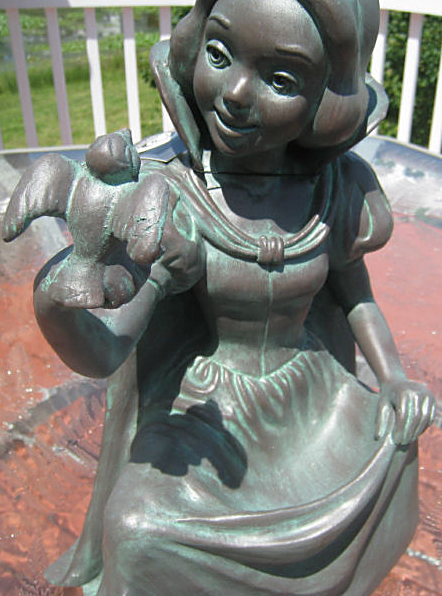 Painted in a weathered copper finish of greenish black. 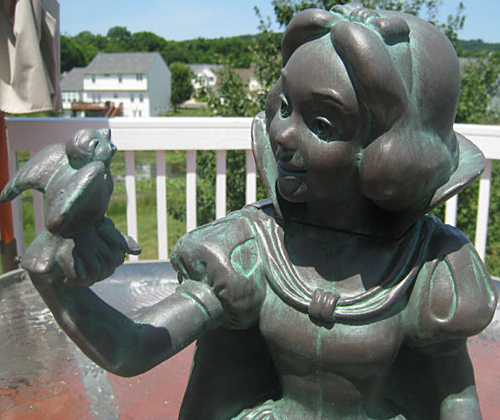 The figure functions as a bird feeder by placing seed in her skirt. 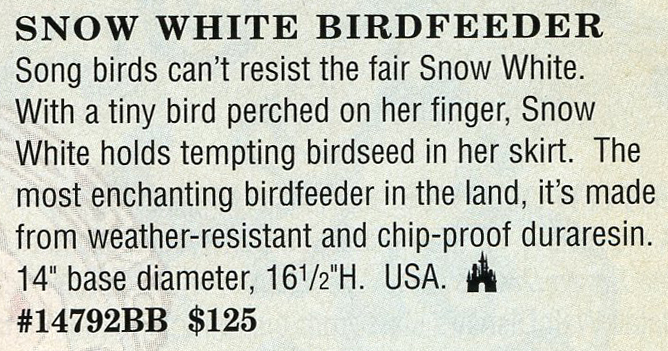 Originally sold through the Disney Catalog in 1997. Retail price $125. 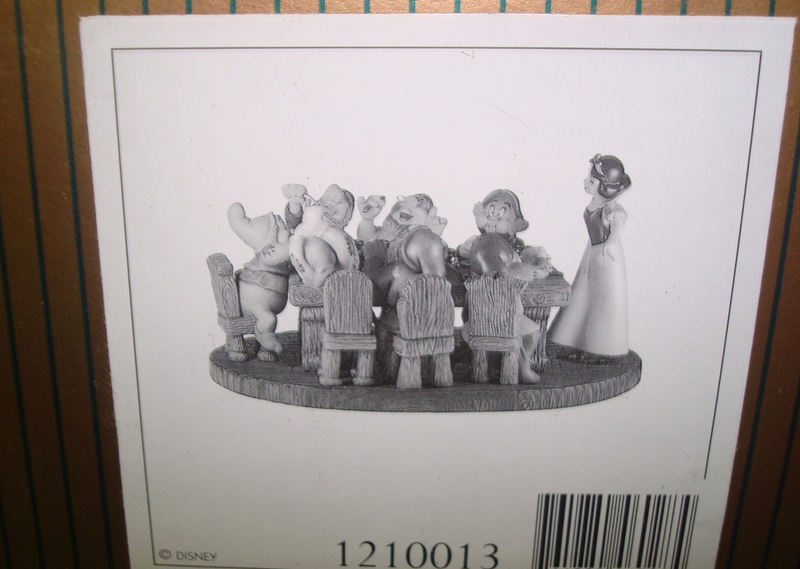 The statue reappeared in a couple 1999 Disney Catalogs along with all Seven Dwarfs. See them in another Archive entry. These handmade string puppets of the Witch and Evil Queen are located in the lobby of the Disneyland Hotel at the Disneyland Resort in Paris. Having not yet had the opportunity myself of visiting this theme park, I first learned about these fantastic marionettes when I came upon this image by British photographer Disney Dan. Witch and Queen photo shot February 2010. Courtesy of Disney Dan. Use with permission. 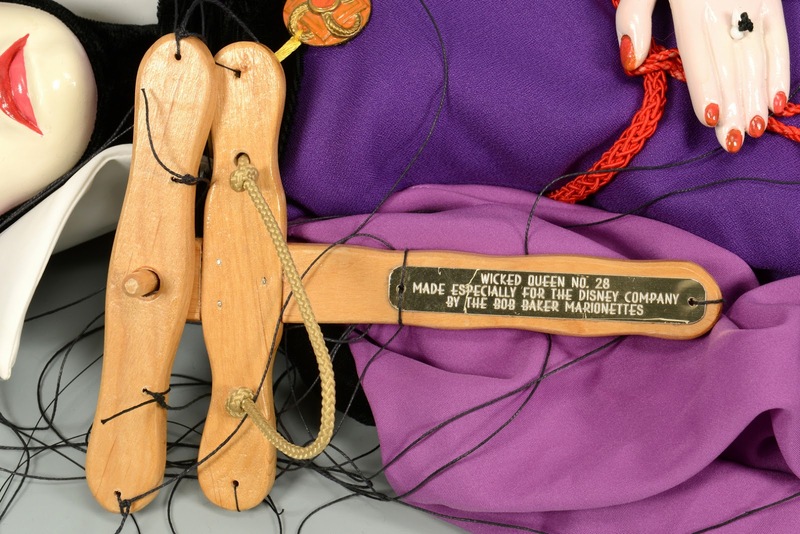 Bob Baker, the artistic mastermind behind these marionettes, was born in 1924, and at the age of only eight, he'd already learned the art of puppetry. By the time he was attending high school in Hollywood, his own fabricated marionettes were being sold to customers in both North America and Europe. Bob at age 12. 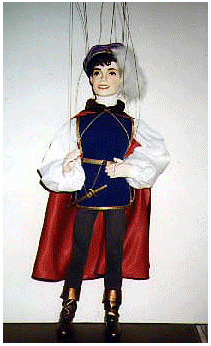 Image via Bob Baker Marionettes. 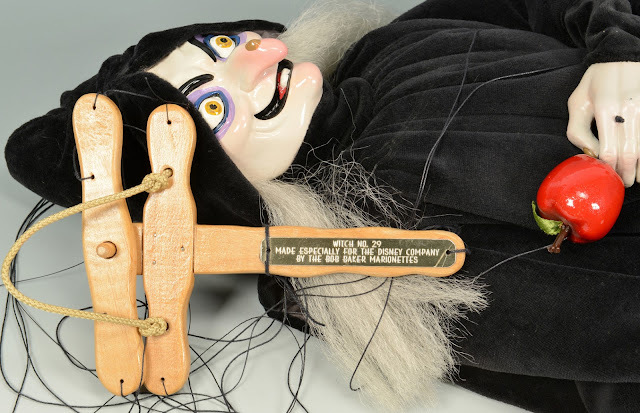 In 1937, he worked at Robinson Department Stores in Los Angeles creating window displays and helping to develop a puppet play for the holidays. 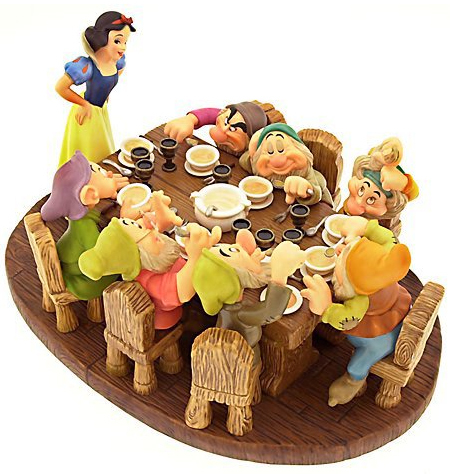 That show turned out to be Snow White and the Seven Dwarfs. 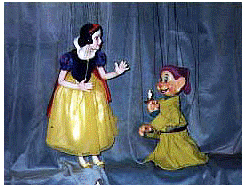 A big fan of Disney, Bob developed other puppets shows over the next few years including one with Dumbo that Walt Disney himself attended. 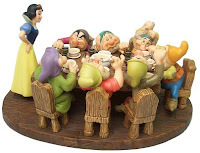 Read the account by Jim Korkis at Mouse Planet. By 1944, Bob had started his own garage puppet factory. In the 50s, he was putting on puppet shows for his own TV program called The Adventures of Bobo. 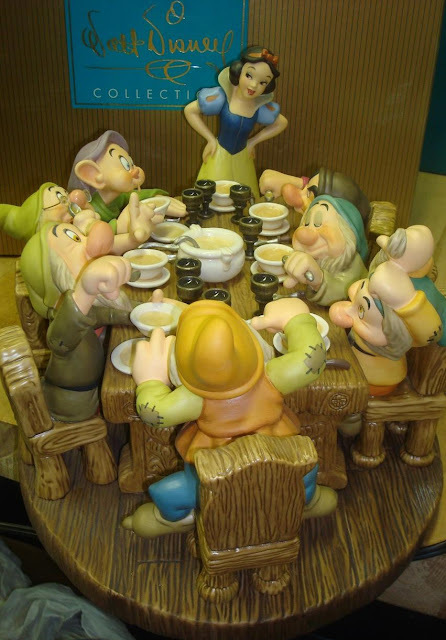 He then went on to work with Walt Disney to create window displays for the opening of Disneyland. 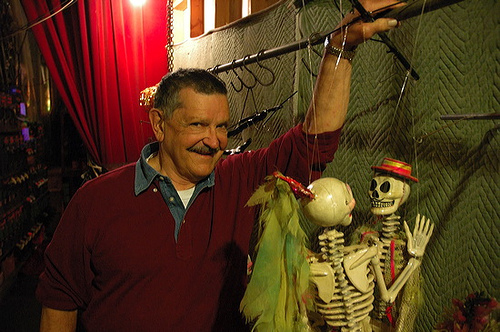 The Los Angles based Bob Baker Marionette Theatre officially opened in 1962 and is still going to this day. 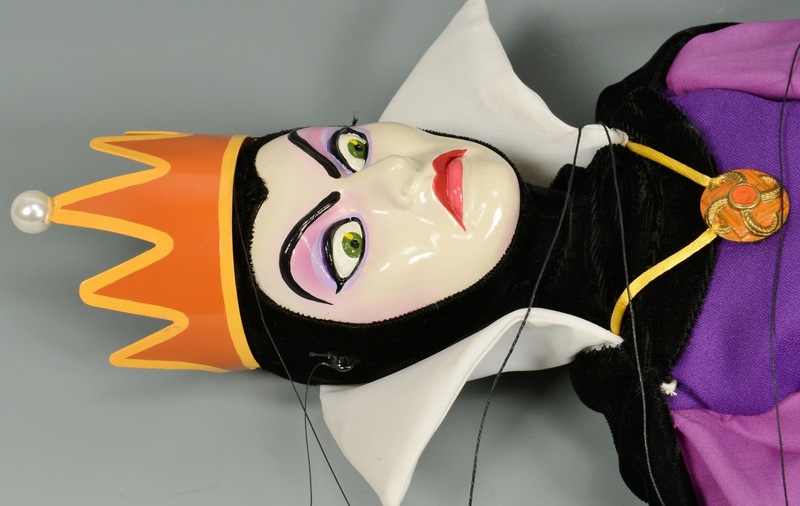 It currently has an inventory of over 3,000 puppets. 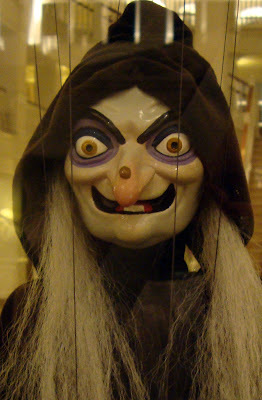 With shows almost daily, it is the longest running puppet theater in America. Bob at his theater in LA, 2009. 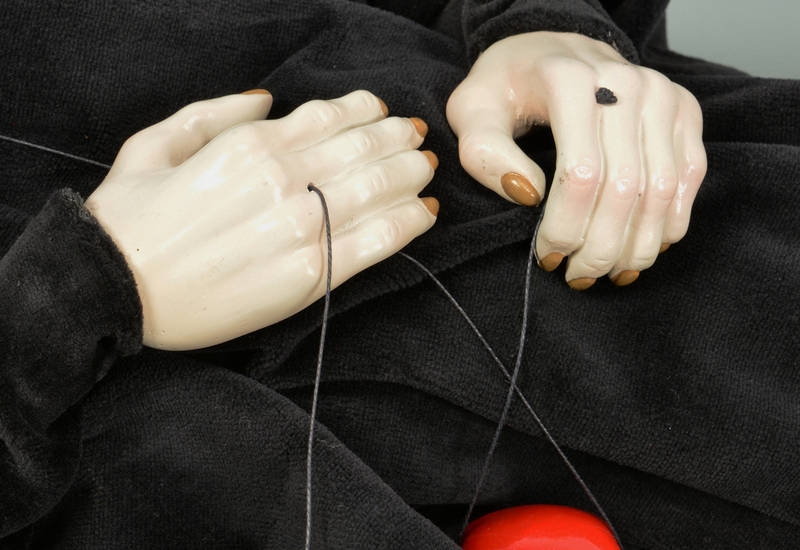 Bob has a long list of credits where his puppet work has appeared in both television and film. 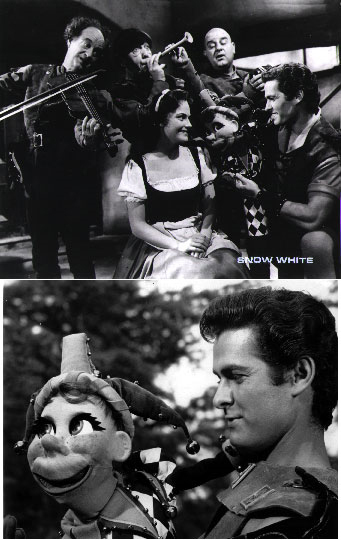 He even created the Quinto puppet who sang (voiced by Mel Blanc) to Carol Heiss in Snow White and the Three Stooges (reviewed by Kurt Raymond in an earlier post). Since the early 1970s, Baker has been the only officially licensed creator of Disney marionettes. His limited edition of Pinocchio is patterned after the original puppet that was used in the creation of the film. After the movie was completed, Bob was given the head which he used as a guide to create this special edition for Master Replicas. 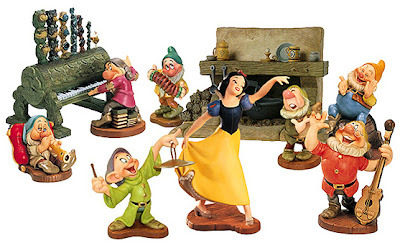 Quinto the puppet in Snow White and the Three Stooges, 1961 + Pinocchio Master Replicas Limited Edition. 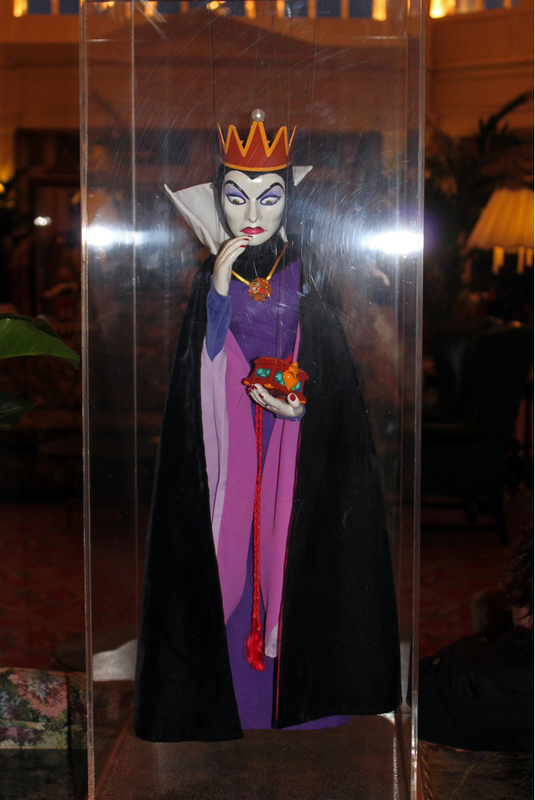 This brings us back to the Witch and Queen marionettes on display at the Paris Disneyland Hotel. Created by Bob, each is a limited edition of only 500. The Queen wears a crown on her head and a medallion around her neck. 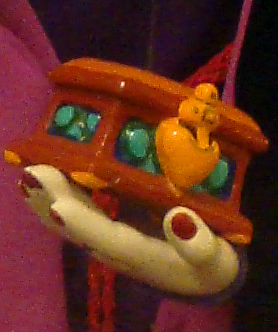 In her left hand sits the ill-boding heart box. 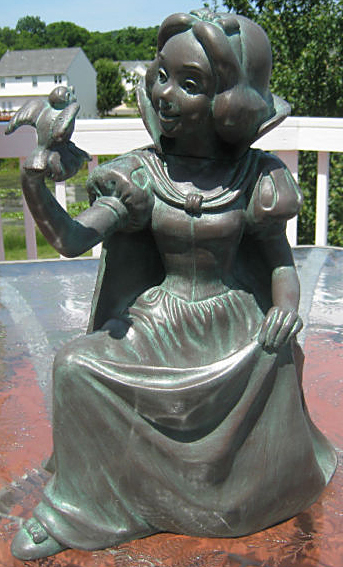 The Witch clutches the poison apple in her left hand and sports a broad yet sinister grin. 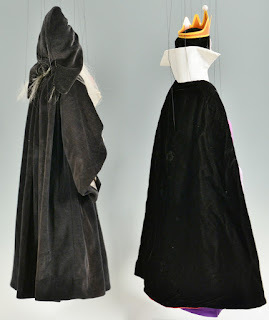 Both measure approximately 28" in length, the Witch slightly shorter. 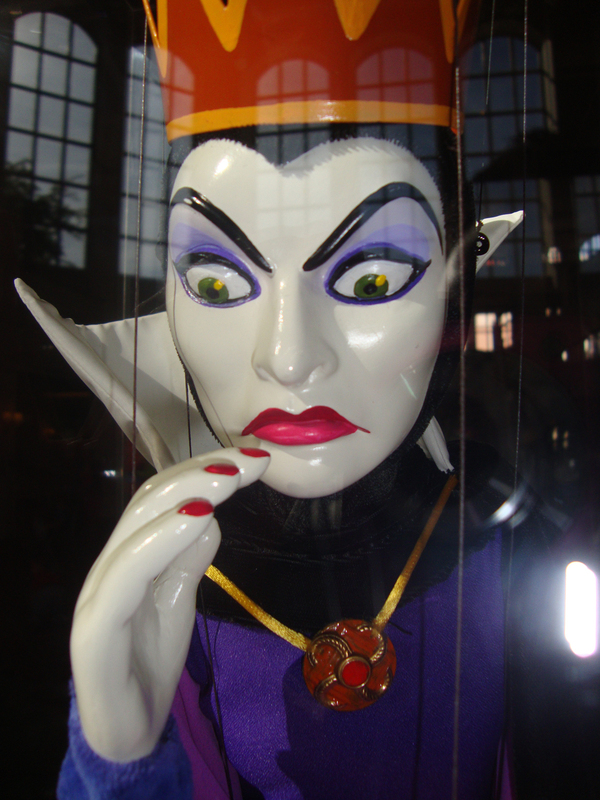 Evil Queen, February 2010. Image courtesy of Disney Dan. Use with permission. Additional Queen and Witch images shot June 2011. Courtesy of Disney Showcase Key. Used with permission. Both puppets have long since sold out, but if you're lucky enough to find one from a reseller, it's likely to retail for well over $1500 (USD). 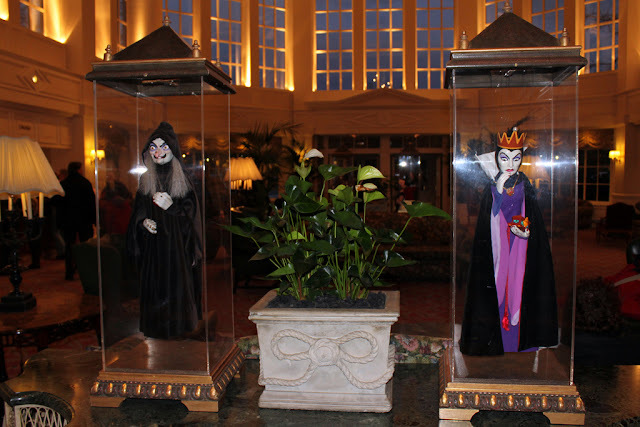 These two marionettes have been on display at the Disneyland Hotel since it opened in 1992. 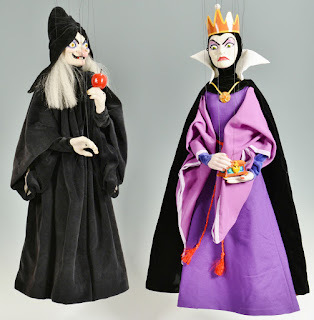 Images via Bob Baker Marionettes. 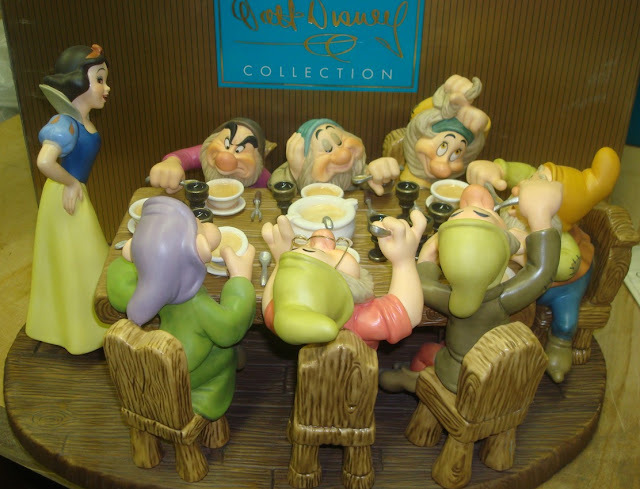 Read an interesting 2009 interview at suite101 where Bob shares stories from his days with Walt Disney and the animators. Special acknowledgment goes to H.P. Hogenboom for his assistance with this post, to Disney Dan for use of his Witch/Queen photos, and especially to Disney Showcase Key for not only taking additional photos but also for tracking down the information about Bob Baker. 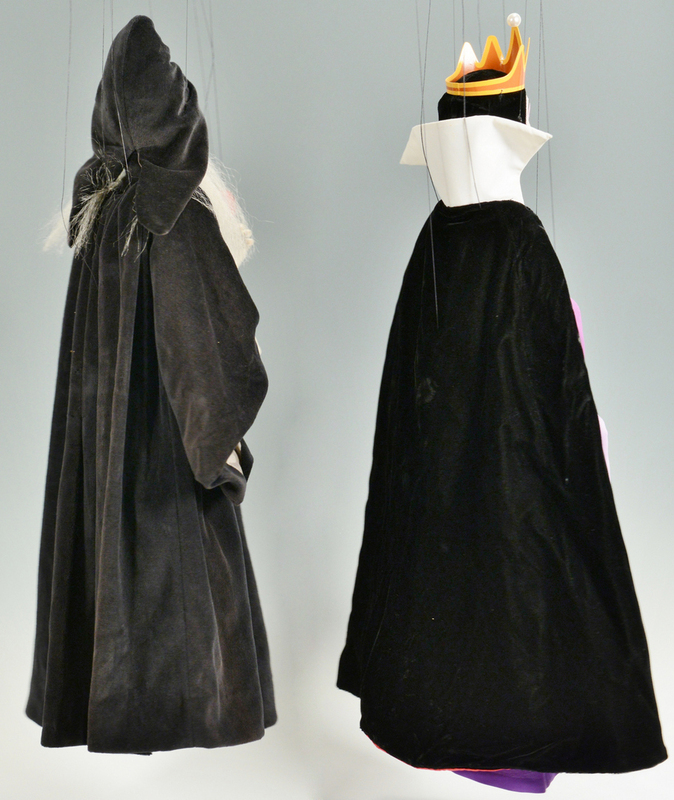 2013 UPDATE: CaseAntiques put the Queen (#28) and Witch (#29) up for auction.The pair sold for $1,860.00. Item Number: 11K-46244-0 (Old)/12170604 (Current). Introduced in October 2001, The Dwarfs' Hearth is a Walt Disney Classic Collection accessory item to be used with the 1995 open edition Snow White and the Seven Dwarfs 'Musical Dance Scene'. 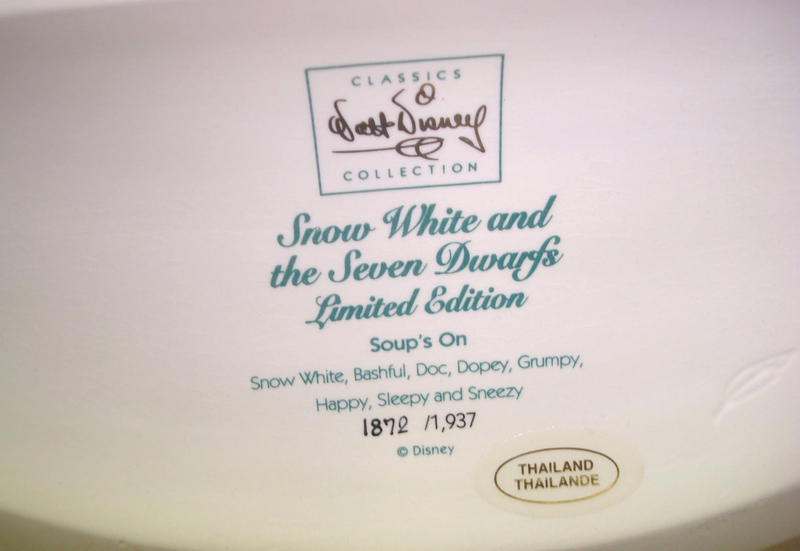 It also would work well with the Signature Series Soups On! from 2000 (seen in the post below). 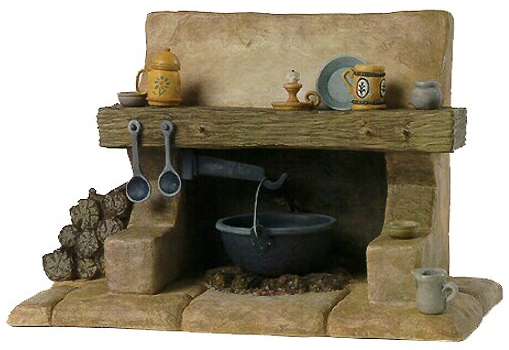 Sculpted by artist Patrick Romandy-Simmons, the fireplace measures 7" tall with a width and depth of 11" x 6". Retailed for $95 (USD). First year production mark was the butterfly from Bambi. Figure was retired in May 2004. In the summer of 2000, Snow White's Soups On! 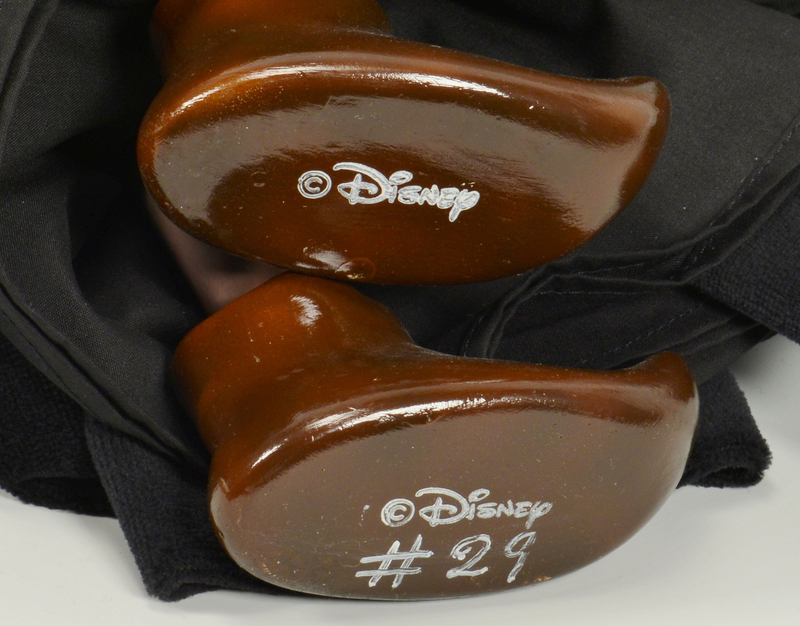 was the first piece released in the Walt Disney Classic Collection's distinctive Signature Series. 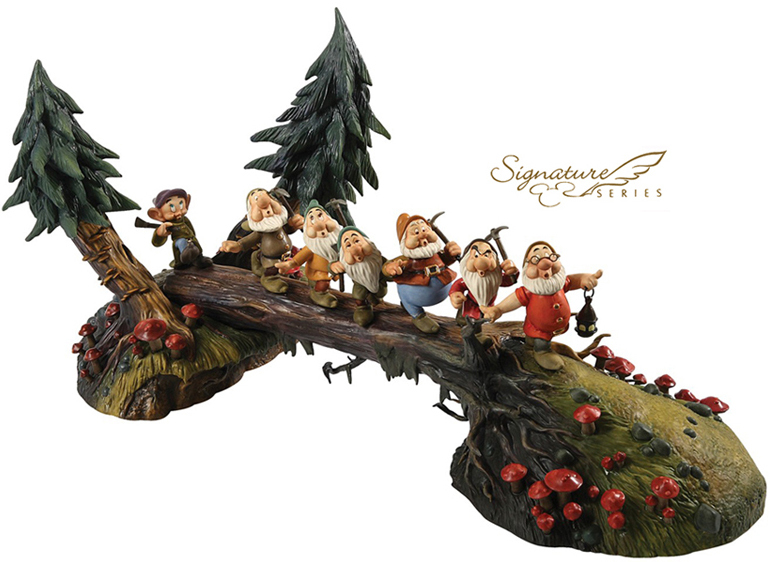 This special limited edition catalogue of sculptures is noted for featuring multiple characters in memorable scenes from the Disney animated films. Snow White and all the Dwarfs surround the dinner table from animator Ward Kimball's deleted "Lost Soup Scene". 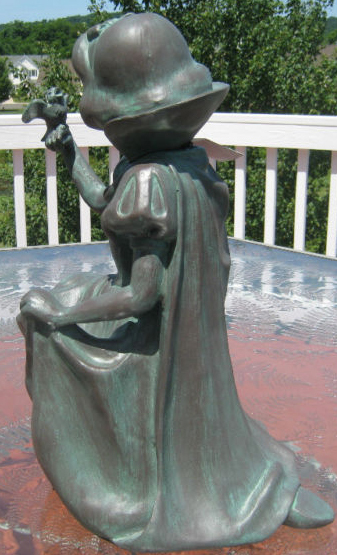 Sculpted by artist Patrick Romandy-Simmons, the piece measures 9 1/4" tall with a length and with of 16" x 11 1/8". 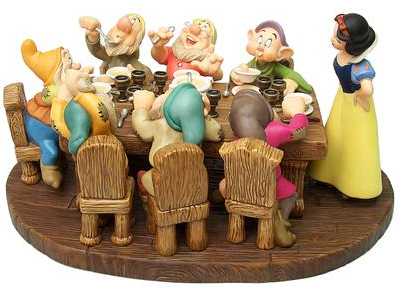 Goblets are made of bronze, spoons and forks from pewter. A clear resin in the bowls and spoons represents Snow's homemade soup. 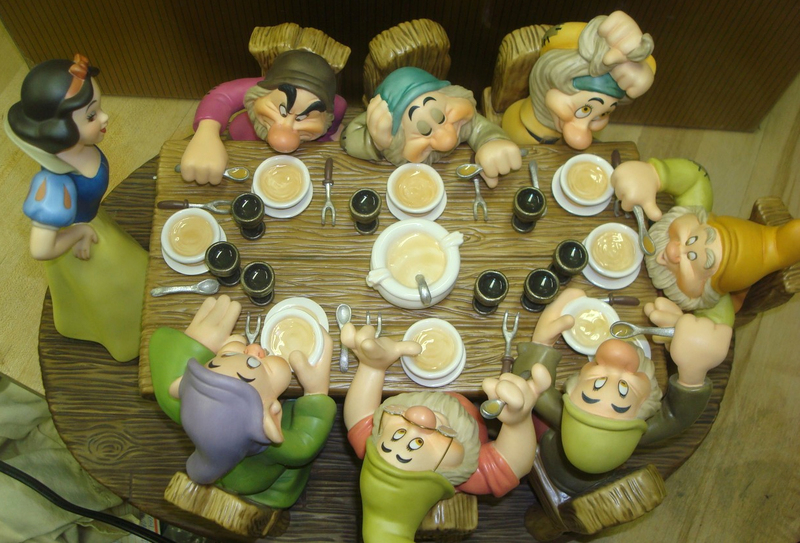 Hidden within the wood grain in each of the Dwarfs' chairs are letters which spell out, in no particular order, "W - D - I - S - N - E -Y". According to an interview with Romandy-Simmons, "we wanted to do this not only as a challenging point of fun and interest for collectors, but also as a fond salute to the man responsible for creating this magical, classic film along with so many other masterpieces." Soups On! 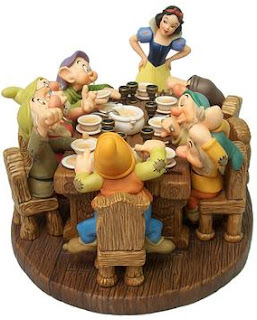 Stock images copyright Disney. Soups On! 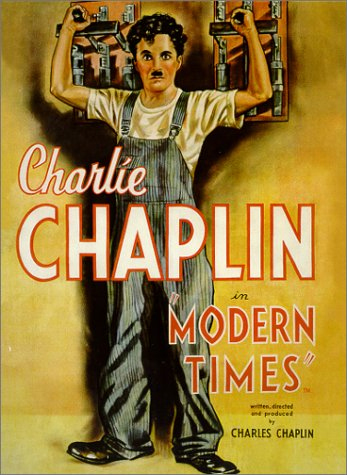 is a numbered limited edition of 1,937 after the year of the film's premiere (or if you prefer, the year the scene was cut). 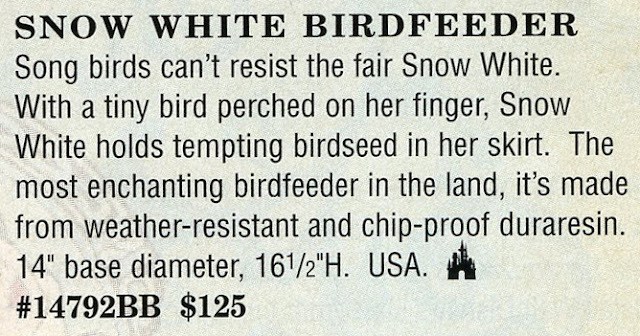 Retailed for $1,975 (USD). Resellers today want big bucks for it. Numbered Limited Addition. Note production year stamp from 2000 (Dumbo's feather). 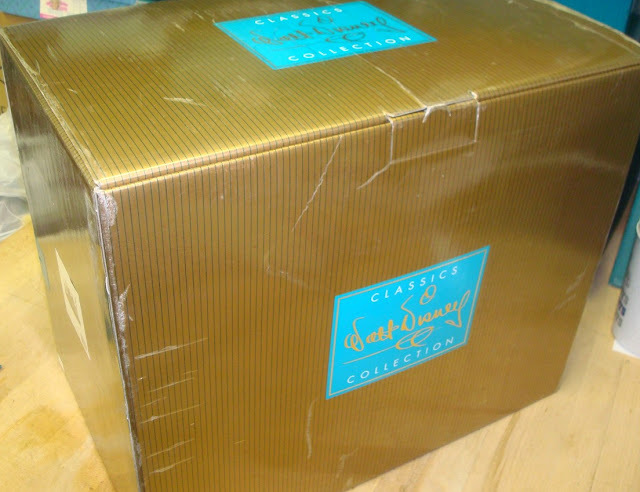 The figurine came packaged in a special gold box rather than the standard green. 2. Booklet detailing the story behind the "lost scene"
4. 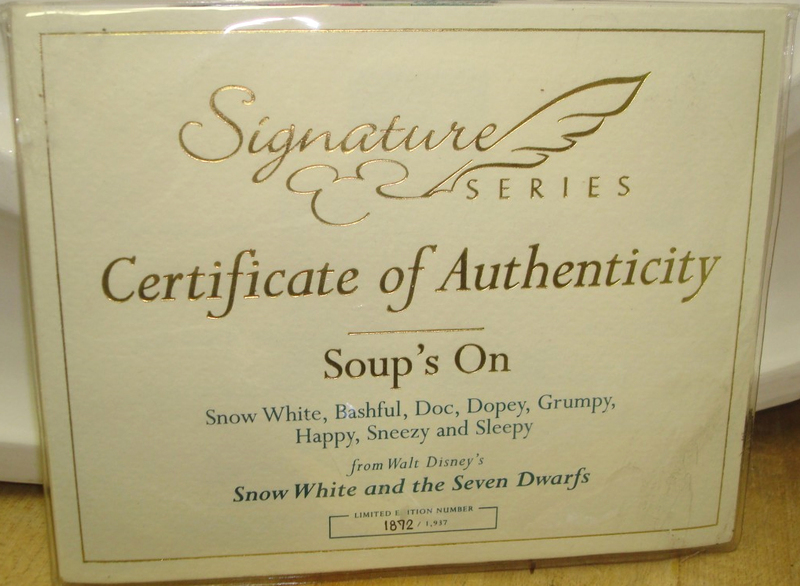 Certificate of Authenticity . 5. Notification registration card for next sculpture in the Signature Series. Released in 2009, Heigh Ho...Home from Work We Go! 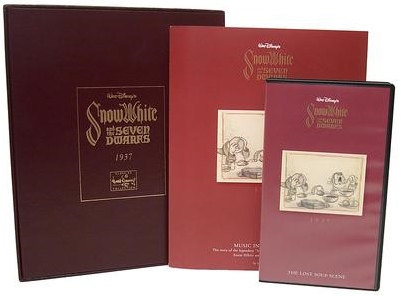 is the 9th release and the second Snow White-theme to be included in the Signature Series. 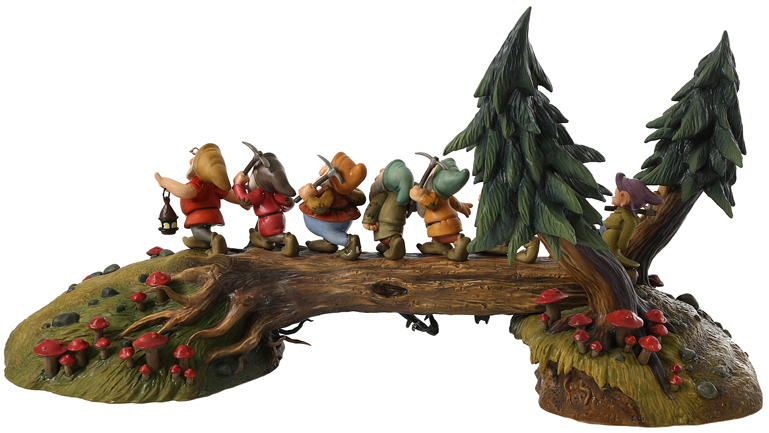 The Seven Dwarfs march home across the log in another sculpt by artist Patrick Romandy-Simmons. 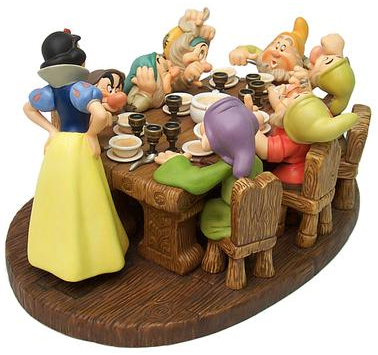 The figurine measures 24" in length, 10" wide and approximately 12" tall. Eighteen pieces of pewter make up the tree roots and six for the pickaxes. The lamp handle is fashioned from brass. Tree tops are resin. The piece is a numbered limited edition of only 750. Retailed for $999 (USD). 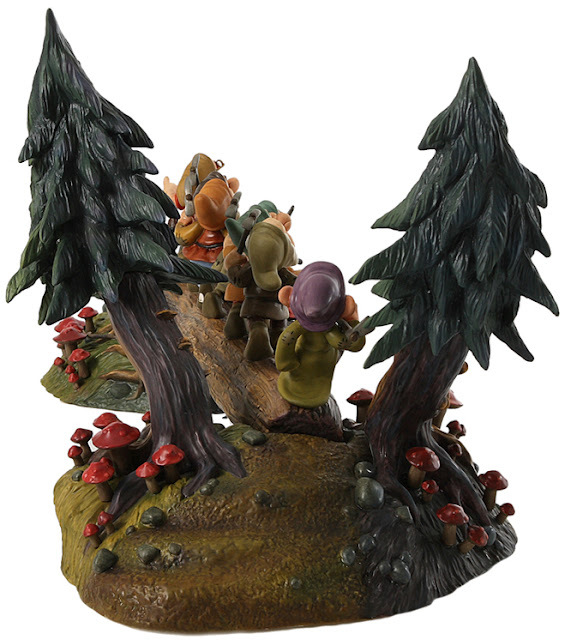 Enesco. Sculpture info courtesy of Duckman's WDCC Inside Report. At the Disney Studio in the late 1930s, the Snow White project set such a new precedent of operations on so many fronts, that both Walt and Roy sometimes found themselves having to figure out just what their next step should be. 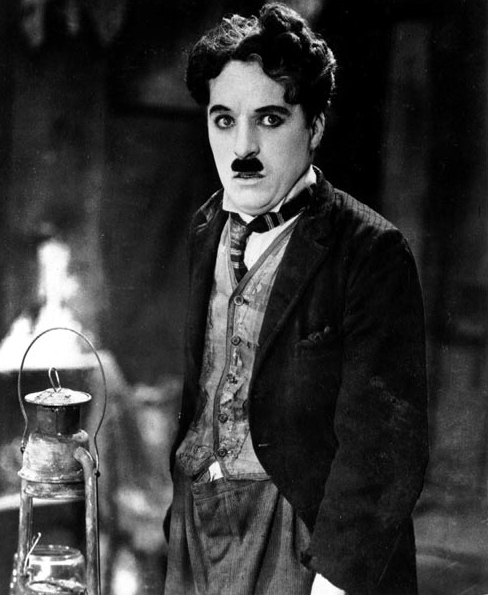 When it came to feature-length motion pictures, they were very much like newcomers to the business of Hollywood filmmaking. Belgian Biscuit Tin - "Disneyland"